I’m just in a funk with this hand planing. I can’t seem to motivate myself to do it. Granted, I typically don’t get much shop time in a week anyway (even if I wanted it), but the times when I could get some in, I just balk. 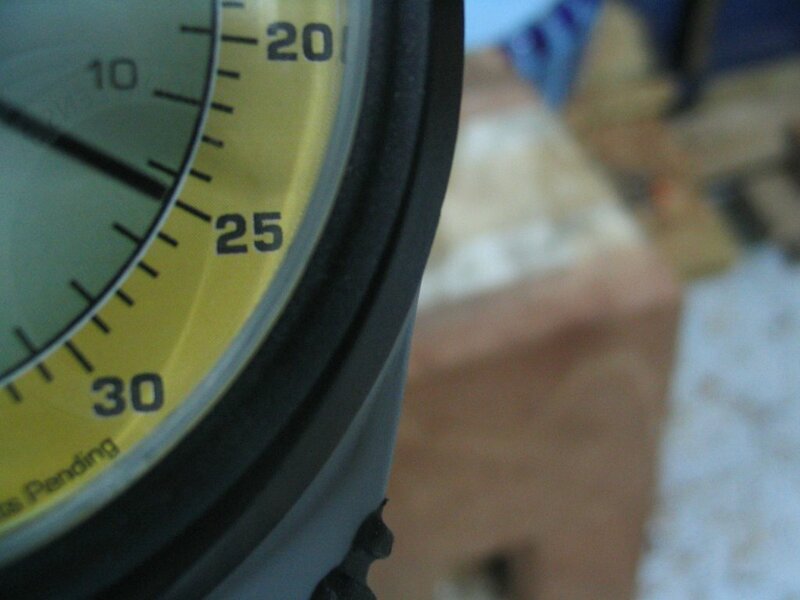 It seems like there is still so much material to take off the top to get it flat AND level. I don’t even feel like blogging about it. Which is why I am. I’m hoping that getting it out there will in some small way give me a push towards moving forward. My guess is that one or two more good sessions on the bench will get me close enough that the light at the end of the tunnel will be bright and near, and the rest would be easy. In the academic world, the term ABD is almost a dreaded one. It stands for “All But Dissertation” and refers to that point in your Ph.D. studies where you’ve done all the coursework and all of the research, have defended your research proposal, and “merely” have to do your dissertation to finish your degree. As for me, I am now officially ABD in regards to my workbench: All But Dovetails. 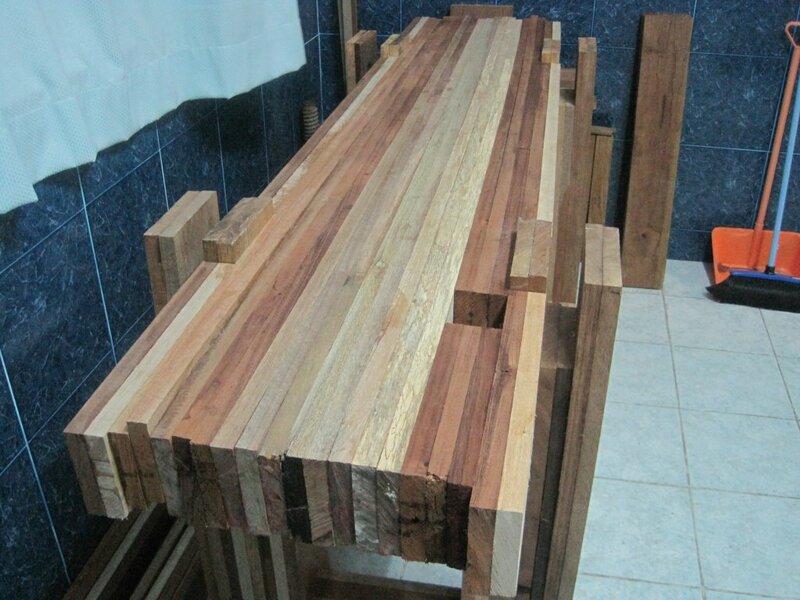 I have glued up 24 out of the 28 boards for my benchtop. I now need to cut the dovetails on the outer leg tenons and then glue up the last two boards on each side (to fit the dovetails). For a long time, I have dreaded this step in the process. 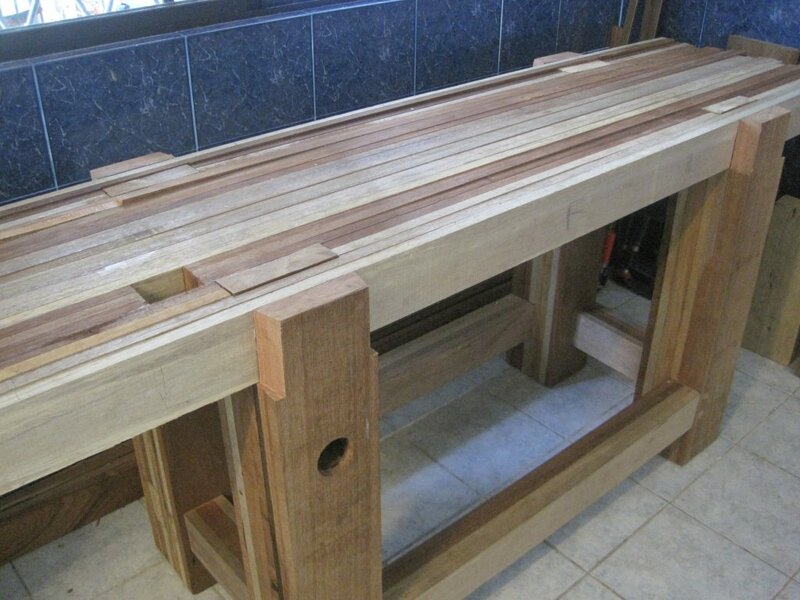 What if my measurements are slightly off and the benchtop won’t fit on the legs? 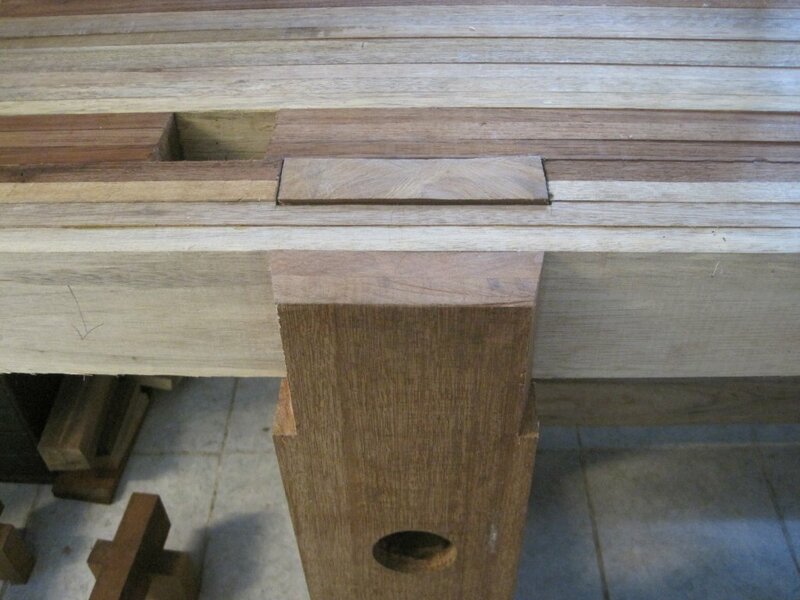 Dovetails are not the most complex job to perform but they are more difficult than perfectly-straight or even 45-degree joints. But now that I’ve gotten to this point, it’s really not that intimidating. 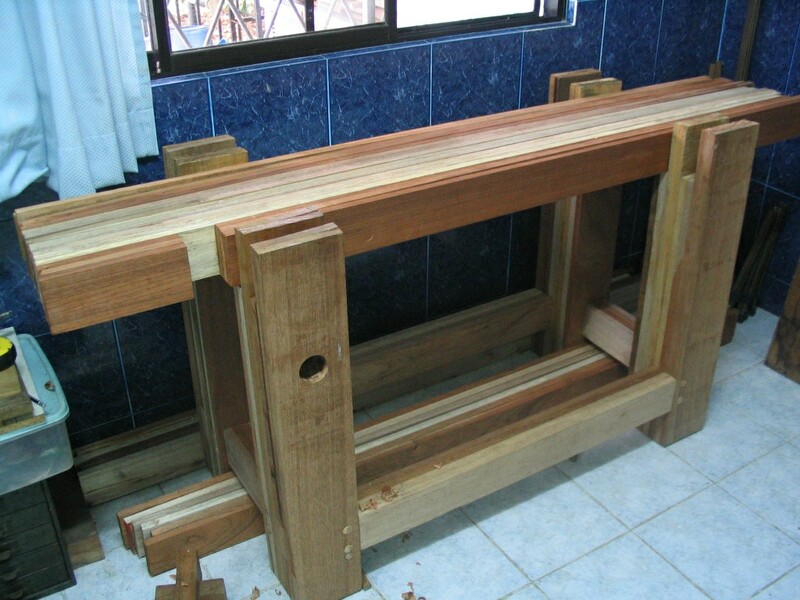 The benchtop is snug enough with the inner leg tenons that joint-al perfection is not necessary with the dovetails. I will try to have the front and top be as tight with the legs as possible, but quite honestly, I might just over-pare the unseen part of the joint just to ensure that I don’t have issues with over-snugness. 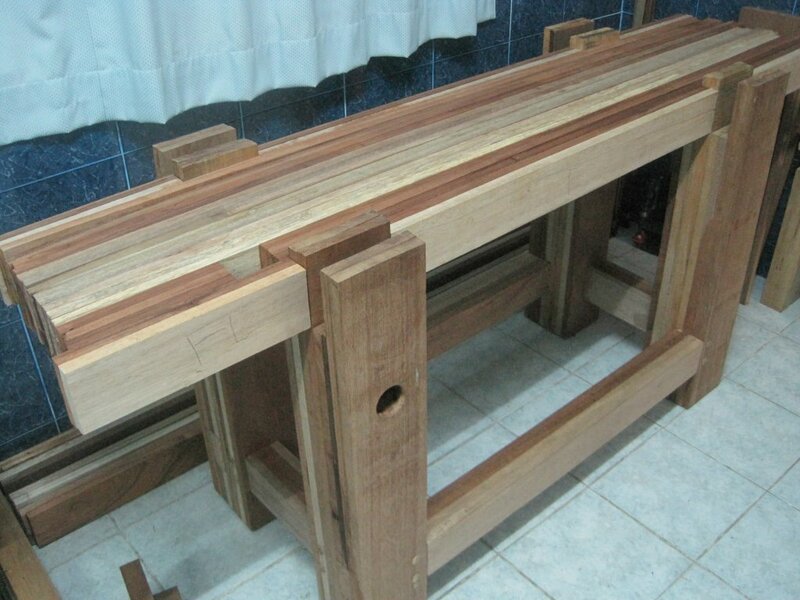 As it is, with four of the eight tenons, it is a bear to get the benchtop off the legs. I am making progress on the bench, but as before, I get hung up mentally when I come to big steps in the process. Guess when I wrote my last post? About 2 months ago. Yep, got to another big step in the process and got hung up mentally. Well that, and also just lost my motivation entirely for a few weeks there. I’m back! So gluing four boards onto a 28-board benchtop shouldn’t really be a “big step” in the process, right? Well for me it doesn’t take much. This time it was doing my first glueups around my inner leg tenons. 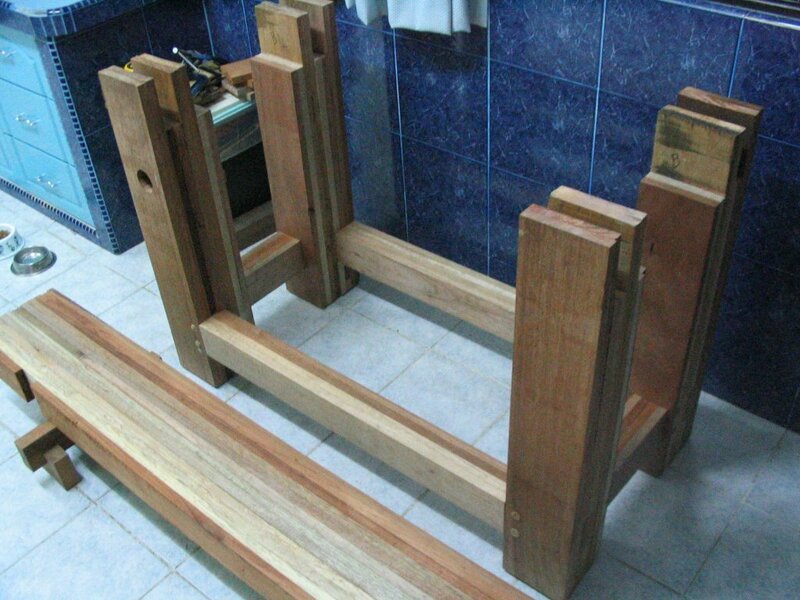 My main concern was that once I put the benchtop on the legs, my measurements will have been so far off that it wouldn’t fit on. You know the fear. Well, no worries, I got it mostly right. Had to pare one “mortise” (they’re all still open on one side) but the other three fit no problem. 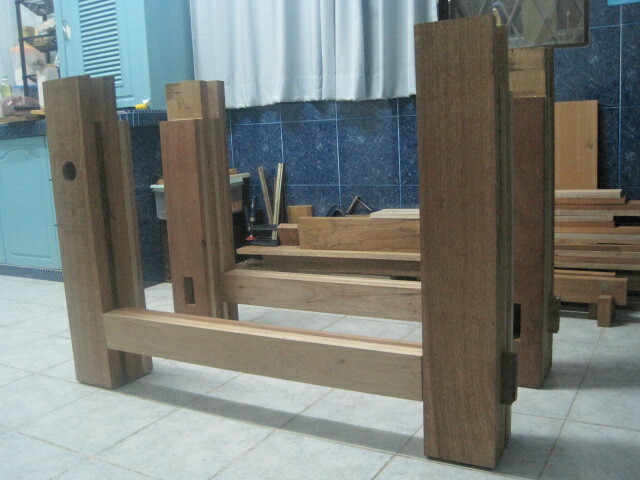 My next step is to touch up the outer boards a tiny bit where they are a bit proud of the tenon cheek. Then I simply need to glue my next two boards in on each side (will need to plane them down a bit to get them to fit just right in between the tenons). Piece of cake. Then the last two boards on each side will be the ones that fit around the dovetails. That will be another “big step in the process.” Wish me luck! So I followed Gye’s advice and followed Kari’s advice and whipped out my block plane to fashion me some pegs for drawboring the tenons on my stretchers. 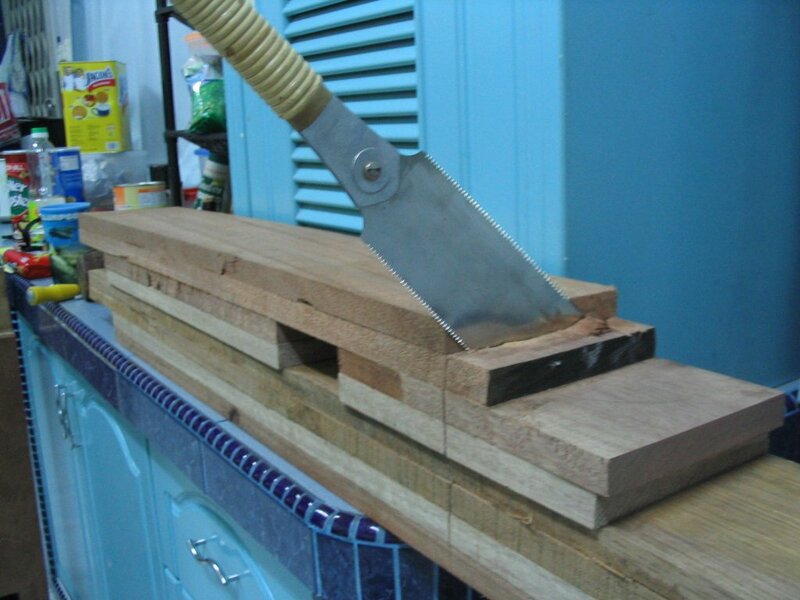 I originally was considering making a dowel plate, but Kari in her post suggests that this works best for short dowels. All of mine are at least 6″ long. 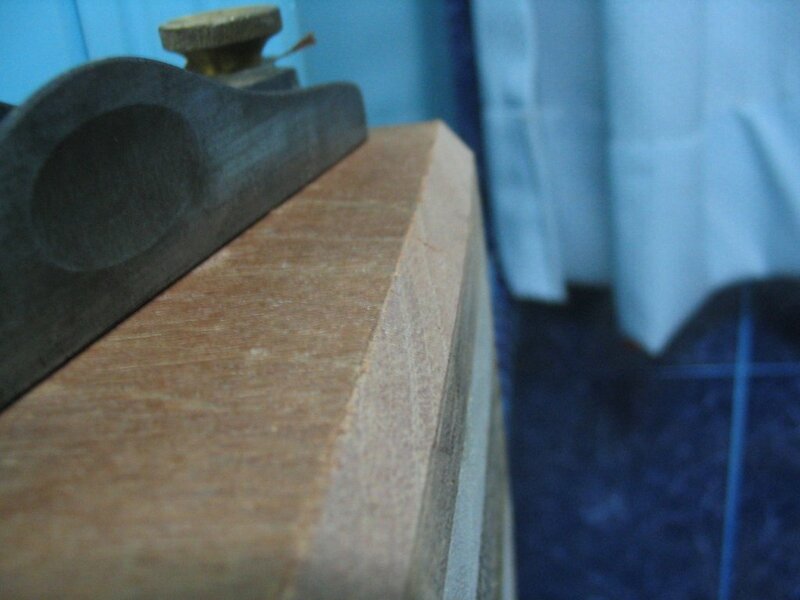 So anyway, the block plane was a bit slow at first, on the corners, but it quickly picked up. I just started at one end until it fit in my test hole and wherever it hung up, I kept at it from that point. 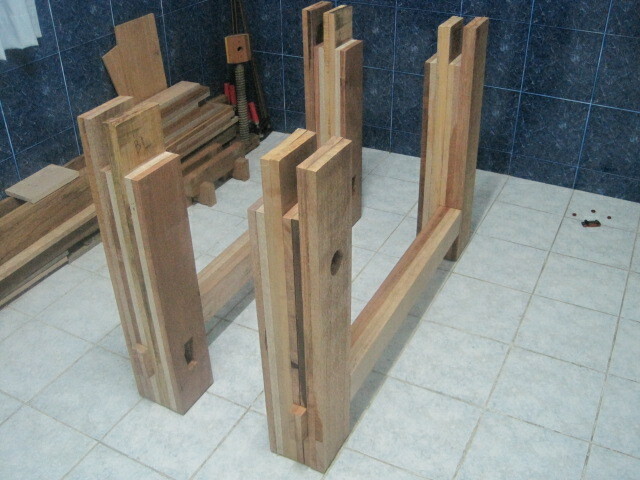 It took about 20 minutes to do that one dowel, which will serve to make 3 or 4 pegs. After this picture was taken I “doweled” the other piece, and I figure I’ll do two more of this length to be safe. 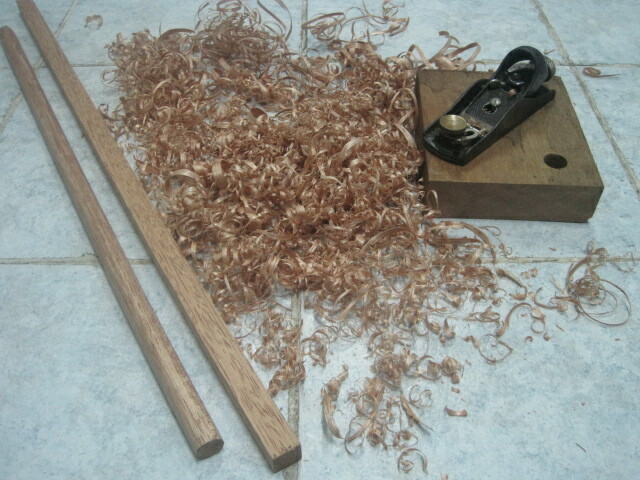 When it was all said and done, I was surrounded by thin ribbons of wood, and was happy I didn’t have a lathe. This was fun. I don’t know what is making me procrastinate on this bench. I think maybe it was the hand planing that was a part of this next step. 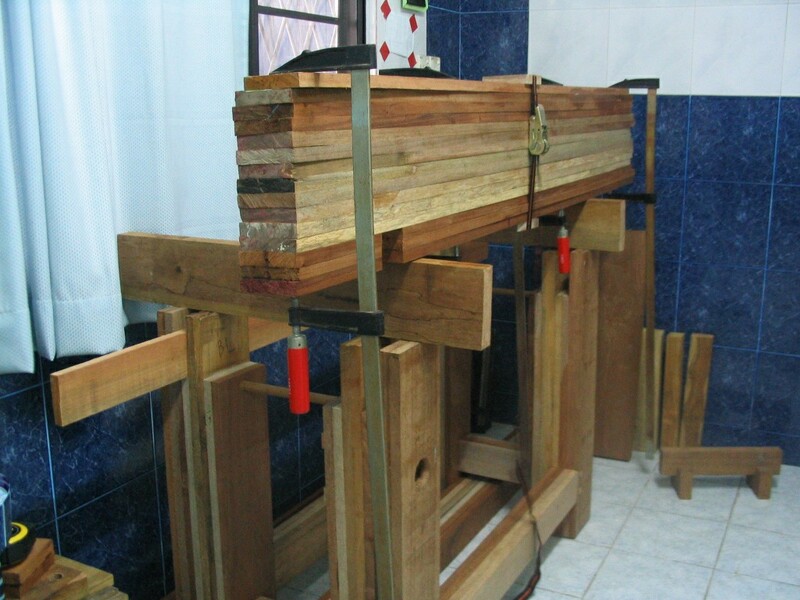 Well anyway, it wasn’t that hard – I just had to make the tenons on the long stretchers a bit narrower so they’d fit nice and snug in the mortises. Not too hard. 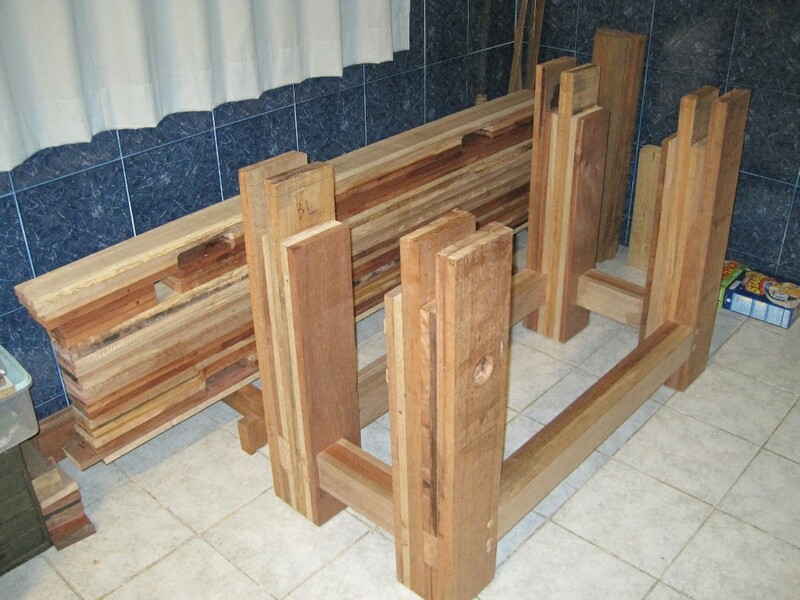 Next step – whittling some pegs for drawboring the stretchers, and at the same time getting a start on laminating the benchtop! Wow, that was tedious. 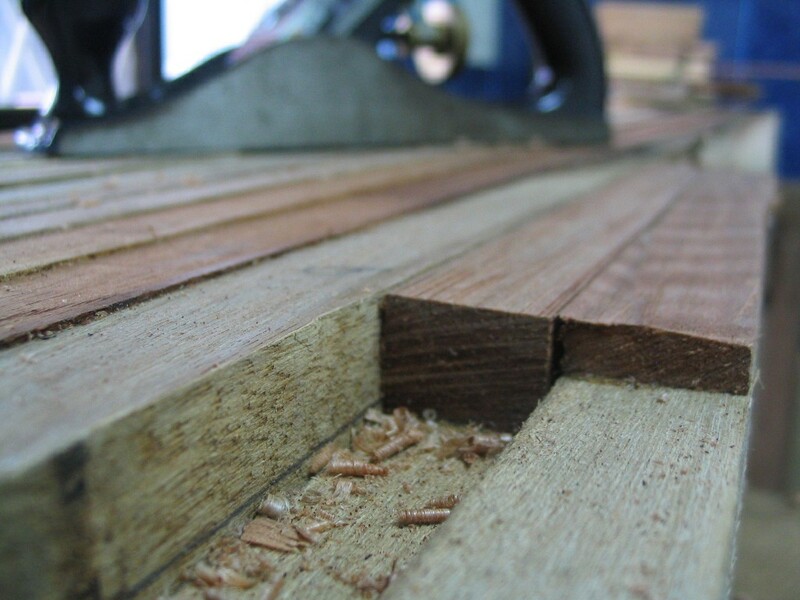 Sawing through a 6″ x 6 1/2″ with a ryoba was no joke. Then I had to flatten the bottom. Not too bad. Creating the chamfers on the bottom of the legs was fun, though. Then I weighed the leg with my luggage scale just for kicks. All four legs are done. Next: fitting the long stretchers! P.S. The post title is my general feeling after seeing my legs lying horizontally on the ground for such a long time. It’s good to see them upright!